It may be synonymous with fashion, but there are many great things to do in Milan that don’t require you to know your Gucci from your Louboutin. 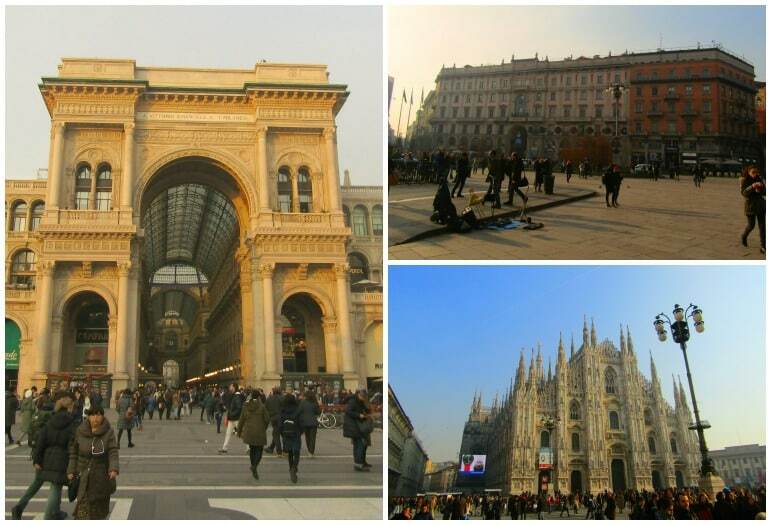 Milan is known as the commercial city of Italy and I was staying at UNA Hotel Century in the business district, yet I was taken by its life and culture. Bustling squares provided the ideal opportunity to watch the world go by. Meanwhile the city’s many museums, exhibitions and of course the architectural wonder of its cathedral, or duomo, was the backdrop for my explorations in what was for me, a new destination. I started my trip by sampling some of the region’s traditional food offerings. A trip to Italy isn’t complete without tasting its delicious dishes after all. Dining in Italy is something of a cultural tour, with each region maintaining its own traditional dishes. 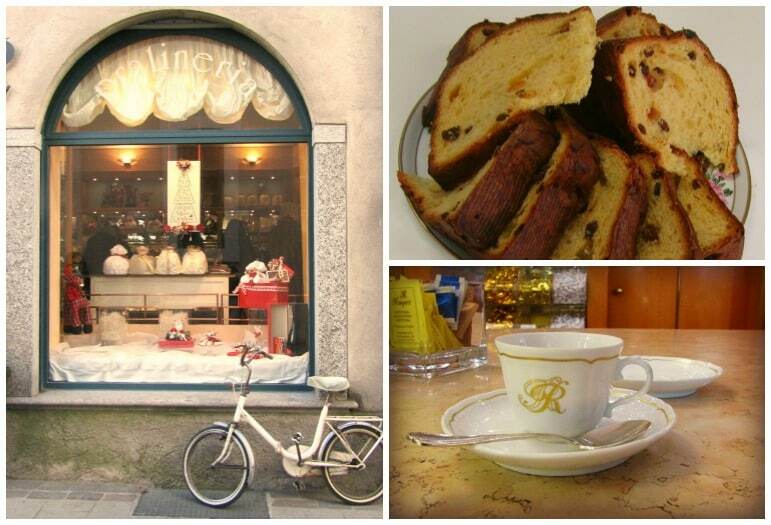 The panettone is Milan’s specialty for major festivities. The Ramperti factory near Lake Como was the perfect place for a baking demo, with its most recent claim to fame being that it produced the wedding cake for George and Amal Clooney, in 2014. Less than 40 minutes outside the city, it has been producing panettones since 1981. Prepared from a family recipe used for five generations, each batch takes days to make. Moscato wine, candied fruits, butter and sugar are mixed with 70 kilos of dough to produce the sweet bread. As I watched the latest batch being meticulously prepared, the sweet aroma of fruit overpowered my senses, and I couldn’t wait to sample some. And the wait was worth it. The bread was soft and perfectly formed, while the orange fruits and hint of wine provided an instant hit of flavour. A light dessert, it’s easy to see why the Milanese love this at the end to a hearty meal. Full on the tasty sweet and back in the heart of Milan, I headed to the Duomo. However, I wasn’t quite prepared for how magnificent the Piazza del Duomo is. As we entered the square, I was struck by the centuries-old buildings while the cathedral itself dominates with Gothic grandeur. Following a wander around the square, it was time for lunch at Spazio Milano, which is run by students and graduates from the cooking school of three Michelin-starred chef, Niko Romito. Well-situated on the top floor of the Il Mercato del Duomo. The light and airy restaurant laboratory was a glorious setting for our five-course degustation meal. A pickled rhubarb starter set the scene perfectly delighting my tastebuds. The steamed cod and potato puree melted-in-the-mouth and yet was full of flavour, while the seafood macaroni was much the same, shaking off the shackles of its straightforward sounding name. Spazio Milano has a very contemporary feel, while the views of the Duomo from high above the square were phenomenal. Popular with locals, you should reserve a table in advance. Time your visit for the mid-afternoon after the lunchtime rush, and for the perfect photo opportunity, ask your waiter for a picture from the restaurant’s balcony overlooking the Duomo. 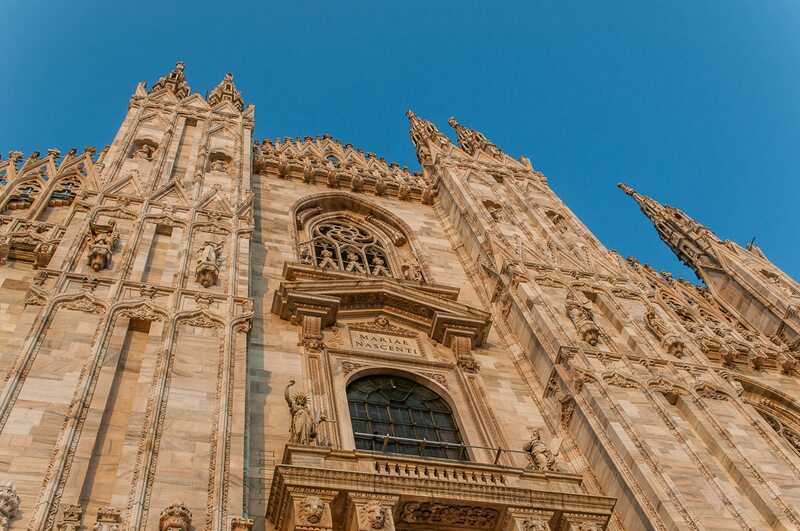 The intricate details of the Duomo’s exterior are undoubtedly breathtaking. I took a guided tour – one of the most popular things to do in Milan – to discover the history behind its construction and on-going works. The cathedral was designed and built by the Veneranda Fabbrica del Duomo, and more than six centuries later, they remain responsible for conserving the site. The majority of the building is constructed from candoglia marble, which gives the Gothic church its pink and grey appearance. As a never-ending project, every 160 years parts of the building are replaced with new marble to maintain its condition. With 135 spires and 3,400 statues, I spotted gargoyles – believed to ward off evil spirits – as well as recent additions including tributes to sporting events such as boxing and rugby. 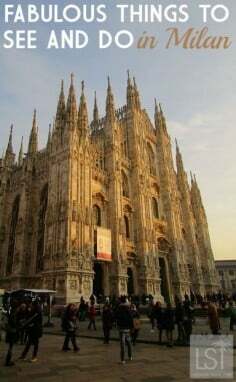 Up on the roof, our guide pointed out Milan’s key sights, while high above us stood a gold statue of the Virgin Mary. Constructed to guide all martyrs, saints and prophets towards heaven, the latest restoration work of the statue features 6,750 books of pure gold leaf to retain this remarkable icon of the city of Milan. Venture inside and there is more to marvel at. The fifth largest church in the world, has stained glass windows featuring key scenes from the Bible as a way of providing access to the Gospel for the rich and poor. 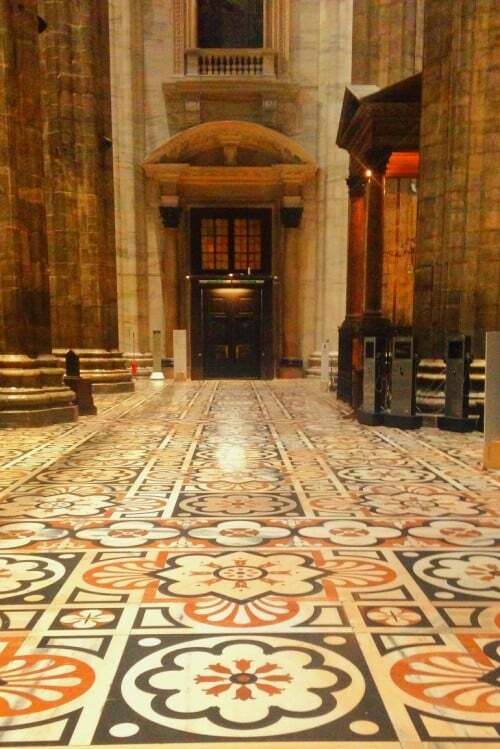 Furthermore the attention to detail paid to its construction, extends to its marble flooring, finally finished in the 1940s following more than 250 years of painstaking work. At the entrance to the Galleria Vittorio Emanuele II, next to Piazza della Scala is the World of Leonardo museum. This is one of the more unusual things to do in Milan, but fans of Leonardo Da Vinci’s work – and even those less familiar with it – will love this exhibition, which unlocks some of the secrets behind his inventions and paintings. Da Vinci moved to Milan in 1482, where he spent the next 20 years and created his masterpiece, The Last Supper. The museum also has a digitally restored version of the original painting – a must-see exhibit before you visit the real thing. Sketching his ideas, Da Vinci never revealed all details of his inventions, and would even include a few red herrings among his drawings to keep his ideas top-secret. While I have never been a huge lover of museums, the World of Leonardo had me intrigued, and it does a fantastic job of unravelling some of the mysteries behind his creations. Only a few minutes walk from Milan’s central station, the UNA Hotel Century is in the heart of the business district – within walking distance of the best things to do in Milan and the busier old town. Following extensive refurbishment of its 144 junior suites, the hotel exudes minimalist and contemporary elegance. 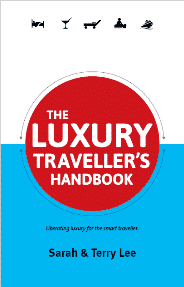 It also has a number of new features including a cinema and fitness rooms adding to the guest experience. 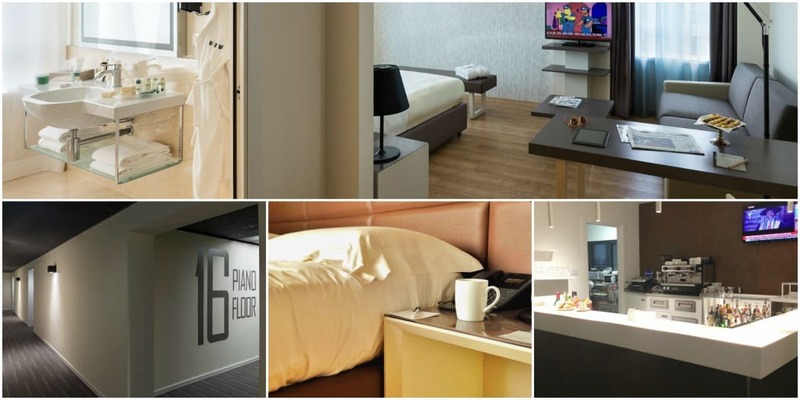 One of 31 UNA Hotels across Italy, it is just 15 minutes walk to Milan’s centre. And the warm welcome I experienced, combined with the most restful sleep I have ever experienced were standout features for me. I visited Milan on a trip with UNA Hotels, all views here are my own.